08 Oct 2004, Orlando, Florida, USA – Tracy Chapman, Michael Stipe & Bruce Springsteen perform in support of the Democratic rally for presidential candidate John Kerry during the “Vote for Change Tour 2004” concert held at the TD Waterhouse Center. 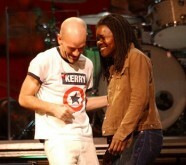 08 Oct 2004, Orlando, Florida, USA – Michael Stipe and Tracy Chapman perform in support of the Democratic rally for presidential candidate John Kerry during the “Vote for Change Tour 2004” concert held at the TD Waterhouse Center. 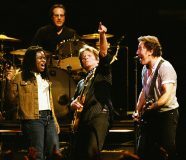 08 Oct 2004, Orlando, Florida, USA – Singer Tracy Chapman, musicians John Fogerty and Bruce Springsteen and Max Weinberg on drums perform in support of presidential candidate John Kerry during the “Vote for Change Tour 2004” concert held at the TD Waterhouse Center. 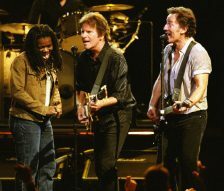 08 Oct 2004, Orlando, Florida, USA – Singer Tracy Chapman, musicians John Fogerty and Bruce Springsteen perform in support of the presidential candidate John Kerry during the “Vote for Change Tour 2004” concert held at the TD Waterhouse Center. 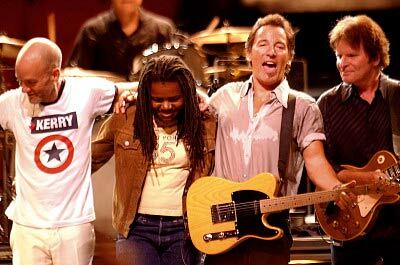 08 Oct 2004, Orlando, Florida, USA – Musician John Forgety, singer Tracy Chapman and Bruce Springsteen perform in support of the Democratic rally for presidential candidate John Kerry during the “Vote for Change Tour 2004” concert held at the TD Waterhouse Center. 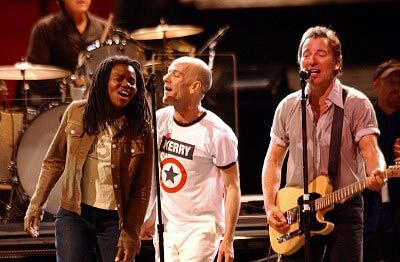 08 Oct 2004, Orlando, Florida, USA – Michael Stipe, Tracy Chapman, Bruce Springsteen and John Forgety perform in support of the Democratic rally for presidential candidate John Kerry during the “Vote for Change Tour 2004” concert held at the TD Waterhouse Center. Along with favorites such as “Fast Car” and “Give Me One Reason,” she also included a lovely rendition of the 1960s Civil Rights anthem “A Change Is Gonna Come.” She joined Bruce Springsteen on “My Hometown” and took the stage with all musicians for the rousing finale, “People Have the Power”. There’s a lot of testosterone on stage for tonight’s Vote for Change shows in Orlando and Kissimmee, which makes the presence of Tracy Chapman all the more timely. Chapman, a late addition to the Springsteen/R.E.M. bill at TD Waterhouse, is joining the tour for just one show, but she couldn’t be more pleased that it’s in Florida. She thinks the state is crucial in the presidential election, especially after the voting controversy four years ago. “I see the role that I’m playing in the same way I see so many other people after the election of 2000,” she says. “I felt motivated to do more than cast my own vote. Chapman’s motivation has already inspired her recent “Western Swing State Tour,” a five-city trek to register voters in Oregon, Washington, New Mexico and Arizona. The shows were organized with help from Drivingvotes.org, an organization devoted to registering Democratic voters in key states. Chapman is convinced that turnout, rather than undecided voters, will ultimately put the next president in the White House. She is encouraged by a recent New York Times story about an increase in traffic at voter registration sites. “As a musician, I have a way to bring people together with my music,” she says. It’s hard to define how politically motivated concerts might affect potential voters. Rock icon and Orlando resident Roger McGuinn doesn’t think music ought to be used to change someone’s vote. Chapman doesn’t want to preach to anyone. 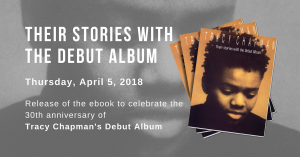 Chapman’s music has touched on social and political causes throughout her career, including anti-apartheid movements on college campuses where she launched her career in the 1980s. None of that can compare with the intense feelings she has seen in this election year. “All of the other causes in some way are all political,” she says. “If it’s talking about human rights issues or it’s something related to the economic issues, ultimately it’s political. She calls it a convergence of “a lot of circumstances that have come about in last four years,” starting with the contested 2000 election. If rock stars are “morons,” as Alice Cooper once observed, should music have a role in choosing the next president? Whatever the answer, Chapman says it already has. ORLANDO — Music fans, not to mention potential voters, were treated to a heady duet of music and politics when the “Vote for Change” tour swept through Orlando on Friday night. People wearing band T-shirts alongside folks sporting campaign buttons poured into the TD Waterhouse Centre to hear Bruce Springsteen and R.E.M. But before they even got to the door, there were activists ready to hand out materials or shout support for their particular causes. There were supporters of presidential candidate John Kerry, supporters for Democratic Senate candidate Betty Castor and even an activist or two for greyhounds. Not surprisingly, most of the activists leaned to the liberal side. Phoebe Cohen, a member of the League of Conservation Voters, an environmental group in Orlando, passed out flyers from her group in front of the arena. Her friend Jeff Shelby was dressed in an over-size John Kerry costume, similar to those seen at parades. She said Kerry has an even better record on the environment than former Vice President Al Gore. She said the group has graded politicians, including Kerry, on the environment. John Coggin, also a member of the conservation league, helped out Friday. Cohen did not think she and her friends were preaching to the choir. Coggin said he was sure many people came to the concert just for the music. But that didn’t slow him down. The Orlando event was one of six “Vote for Change” concerts held in Florida on Friday night. James Taylor and the Dixie Chicks performed in Clearwater and Pearl Jam and Death Cab for Cutie were in Kissimmee. Other concerts were in Jacksonville, Gainesville and Miami. The performers are conducting concerts nationwide in support of Kerry. Peg Carroll and Ron Smith, of Port Orange, and Wade Burford and Jacquie Labreche, of South Daytona, said they were attending the Orlando concert for both the music and the politics. Carroll and Labreche were wearing Kerry buttons. “We need a change,” Carroll said. “We’ve got to get our boys home, for sure. It can’t be any worse than it is right now with the deficit and the war that shouldn’t have been done,” said Labreche. Dave Peral was politically active Friday night, but his message was pro-President Bush. On the inside, the message was decidedly political. A large monitor played snippets of other “Vote for Change” artists supporting voter mobilization or criticizing the Bush administration. Michael Stipe, lead singer for R.E.M., recommended Betty Castor for Senate. And he told fans that they should be supporting Kerry. So you mess up one presidential election and four years later a bunch of really cool rock stars do concerts in your state. Springsteen and the E Street Band were joined by R.E.M., Tracy Chapman and John Fogerty for a stellar performance for a packed house ready to hear a partisan message about putting a new administration in the White House in November. Judging by the “Bruuuuccee!” chants before the show, Springsteen was the main attraction. When he and R.E.M.’s Michael Stipe emerged to introduce the show, the Boss told the crowd that he wouldn’t stand for such attention. “Tonight, this is a ‘No Bruuuucccing’ zone,” he cautioned. “We have too many good musicians on the stage.” Then, he offered the night’s mission statement: to fight for a government “that is open, rational, progressive, responsive to its citizens and humane. The Orlando show, one of five Vote for Change shows in Florida on Friday, was the closing night of an 11-state, 33-city trek through swing states sponsored by the political action group America Coming Together. There was the potential for windbag monologues, but Friday night there was more rock than rhetoric. Accompanied by a drummer and a second guitarist, Chapman opened with an expressive 30 minutes that showcased her deep, distinctive alto and eloquent songwriting. Springsteen traded vocals and guitar licks on a pair of songs to close R.E.M.’s set, adding a muscular edge to the melodic “Man on the Moon” with a searing guitar solo. That song lit the fuse on a fiery tear through “Badlands,” “Prove It All Night” and “No Surrender.” With the initial burst out of the way, Springsteen settled into a well-paced show marked by sonic peaks and valleys instead of the nonstop sprints he once delivered. There were moments of reinvention, such as the rocking full-band treatment of Nebraska’s “Johnny 99” flavored by Danny Federici’s accordion and Soozie Tyrell’s fiddle. There was the anthemic power of “The Rising,” which foreshadowed the uplifting finale. When all the musicians took the stage for the rousing finale, “People Have the Power,” it was obvious that the feelings were true — even if some might not think they were right. Most fans went to the ‘Vote for Change’ concert in Orlando to hear Bruce Springsteen and other musicians. But that doesn’t mean they don’t have political opinions. ORLANDO – The thousands of music fans who turned out for the anti-Bush ”Vote for Change” concert in Orlando Friday night were not looking for political persuasion so much as seeking entertainment. And if the musicians affirmed the political beliefs of the majority of the fans, then many said that was just a happy coincidence. From the parking lot outside the TD Waterhouse Centre to the floor of the arena, music fans said they were there to see the headline performers — Bruce Springsteen and the E Street Band and R.E.M. — even if most of the T-shirts and bumper stickers urged Bush’s defeat. Springsteen, R.E.M. and folk singer Tracy Chapman, who opened the show, are among a loose coalition of more than 20 musicians who announced in August that they would perform in 36 cities across 12 battleground states to mobilize opposition to President Bush. The 10-day series of concerts will culminate in Washington on Monday. For most of the show, none of the performers mentioned either of the presidential candidates by name. Instead, they urged the audience to vote for ”a change in the direction of our government,” as Springsteen told the crowd during a brief introduction. Chapman spoke of the struggles of the civil rights movement and women’s suffrage and then segued into a song titled Change is gonna come. Springsteen, who opened his set with Born to Run, was not as overtly political, though he insisted during videotaped interviews played on giant monitors in between sets that the administration had erred in Iraq, on health care, and with tax cuts. Still, not all in the audience were convinced. Tailgating from the open rear hatch of a white Chevy Trailblazer SUV, five friends were debating politics. Two of the five men were Bush supporters, two were for Kerry and one was undecided. ”Music and politics are two different things,” said Duke Gunn, 46, of Richmond, Va., a Bush supporter.